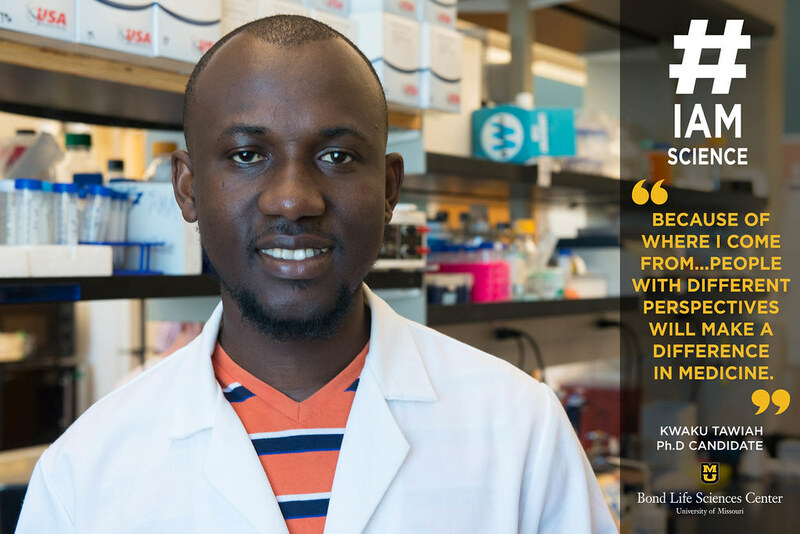 Growing up in Ghana gave Kwaku Tawiah a different outlook on medicine. Tawiah works in Donald Burke’s lab in the Bond LSC, and spends much of his time engineering nucleic acids and analyzing cell cultures. He hopes his research will help with early diagnosis of diseases, and wants to eventually bring it back to Ghana. 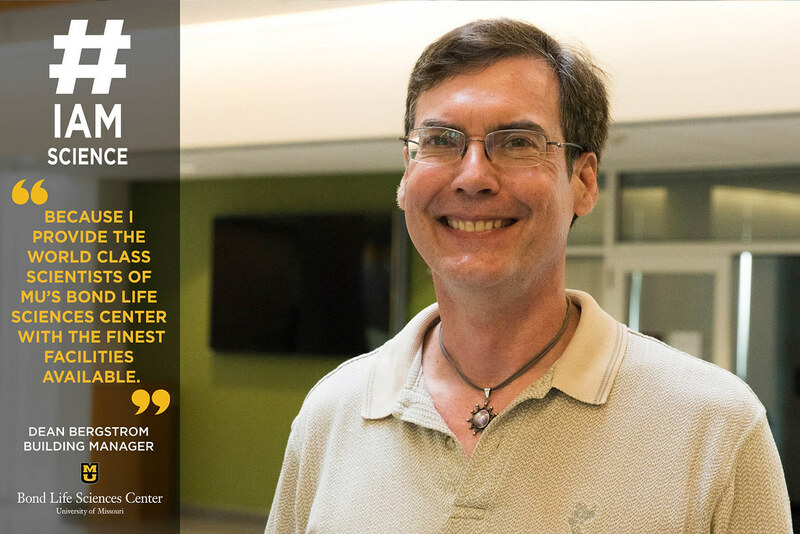 He has a strong relationship with the other researchers and scientists in the Burke lab. Tawiah said that his parents had a direct influence on both his education and career choices. Both his parents were teachers, so they were able to see his strengths and weaknesses, and saw that he was well suited for science. He completed his undergraduate degree at Lindenwood University in 2012 and is currently in his third year as a Ph.D candidate in biochemistry at MU. For young scientists just starting off, Tawiah believes that you must be willing to learn and listen to the people around you. Shannon King, a Ph.D candidate in the Biochemistry department at MU. She works in Scott Peck’s lab at Bond LSC. | Photo by Mary Jane Rogers, Bond LSC. Most of Shannon King’s support system – her friends, grandparents, and boyfriend – are all farmers. They’re her inspiration and part of the reason her career goal is to use science to help farmers. She’s currently a Ph.D candidate in the Biochemistry department at MU and works in Scott Peck’s lab at Bond Life Sciences Center. She’s also part of a $4.2 million grant the MU Interdisciplinary Plant Group received to fund crop research. The official name of the project is “Physiological Genomics of Maize Nodal Root Growth under Drought.” Its goal is to develop drought-tolerant corn varieties that make efficient use of available water. The project is interdisciplinary in nature and includes individuals from MU’s College of Arts and Science, School of Medicine, College of Agriculture, Food and Natural Resources, and School of Journalism. King said part of the fun of this grant is working with her team when things go wrong. Jacqueline Ihnat, one of the 12 Cherng Summer Scholars, outside Dr. Cornelison’s lab at the Bond Life Sciences Center. Sometimes the most learning occurs outside of the classroom. For Jacqueline Ihnat, an opportunity to pursue research at the Bond Life Sciences Center this summer will give her that chance. She recently became one of 12 Cherng Summer Scholars, a full-time, ten-week program within the Honors College at MU. Jacqueline Ihnat’s passion for science started in high school. Her high school biology teacher ignited that love by teaching her how to struggle through difficult problems and concepts. Now, Ihnat is an MU pre-med student with a major in business management and a minor in Spanish. 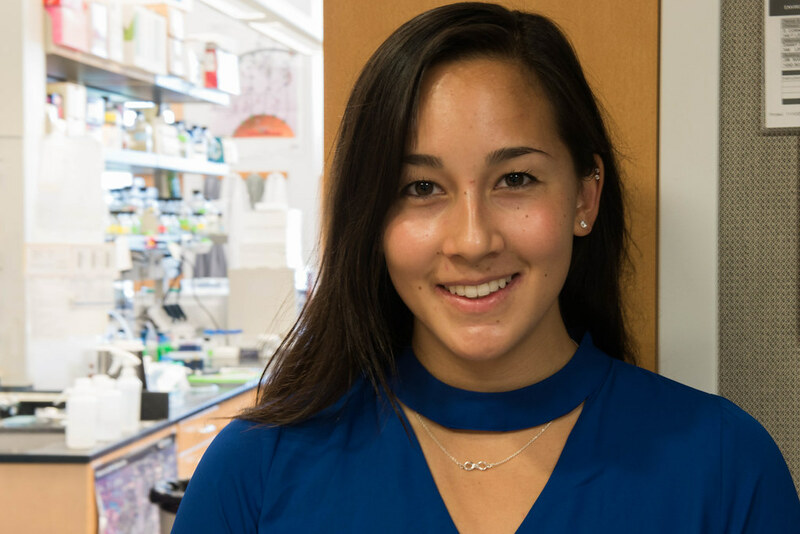 Since Ihnat is fascinated with cells and how our bodies function, she’ll be studying the role of specialized stem cells in muscle regeneration and how they interact with muscle fibers — specifically the role of Eph-A3, a type of cell-surface receptor. This project will take place in the lab of Dawn Cornelison, a Bond LSC biologist who will be mentoring Ihnat this summer. Each muscle in the body is unique in its length, fiber organization and fiber type patterning, so Ihnat hopes to explore why two types of muscle — fast and slow twitch muscle — develop and regenerate to maintain each specific muscle fiber-type composition. When a muscle is damaged from exercise or injury, a muscle’s stem cells, or “satellite cells,” will multiply, move towards the injury and form new muscle, replacing the damaged fiber. There is no research that determines if “fast” satellite cells create fast fibers and if “slow” satellite cells create slow fibers, and Ihnat hopes to tackle that question this summer. This kind of research gives scientists a deeper understanding of degenerative muscle diseases such as ALS, which could lead to more effective treatments and therapies. The Cherng Summer Scholars program is supported by a gift from Andrew and Peggy Cherng and the Panda Charitable Foundation. The Cherng’s are the founders of Panda Express, a well-known restaurant chain. These scholarships support individually designed theoretical research, applied research or artistry projects under the mentorship of an MU faculty member. For young scientists who are just starting to conduct research and struggling to feel successful, Ihnat has a few words of motivation. Jacqueline Ihnat was recently selected as one of the 12 Cherng Summer Scholars within the Honors College at the University of Missouri. This scholarship provides her with $8,000 to fund her summer research. 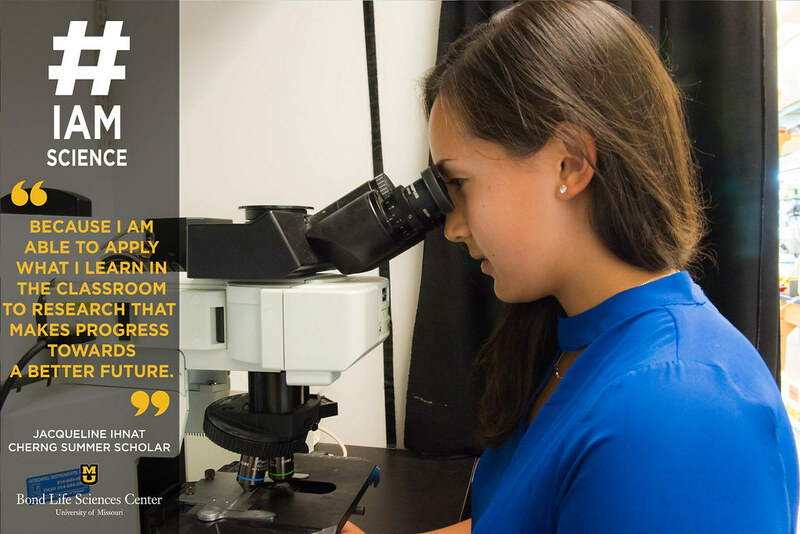 She’s fascinated with cells and how our bodies function, so this summer she’s studying the role of specialized stem cells in muscle regeneration and how they interact with muscle fibers—specifically the role of Eph-A3, a type of cell-surface receptor. Her faculty mentor for this project is Dawn Cornelison, an investigator in MU’s Bond Life Sciences Center. “Doing research helps keep me focused on the bigger picture,” Ihnat said. 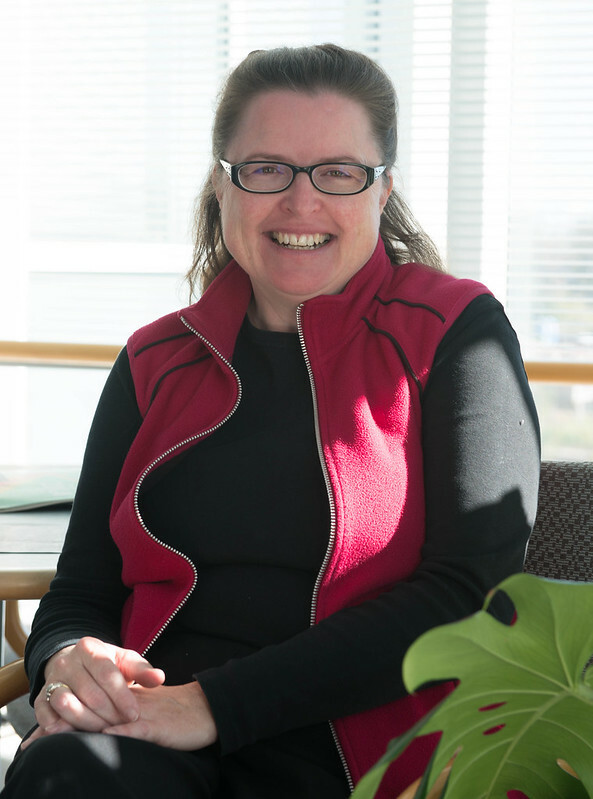 When developmental plant geneticist Paula McSteen thinks about the specimens she studies, one word comes to mind: potential. She thought it as she stood in the midst of the first corn field she ever planted as a post-doctoral fellow in corn genetics. 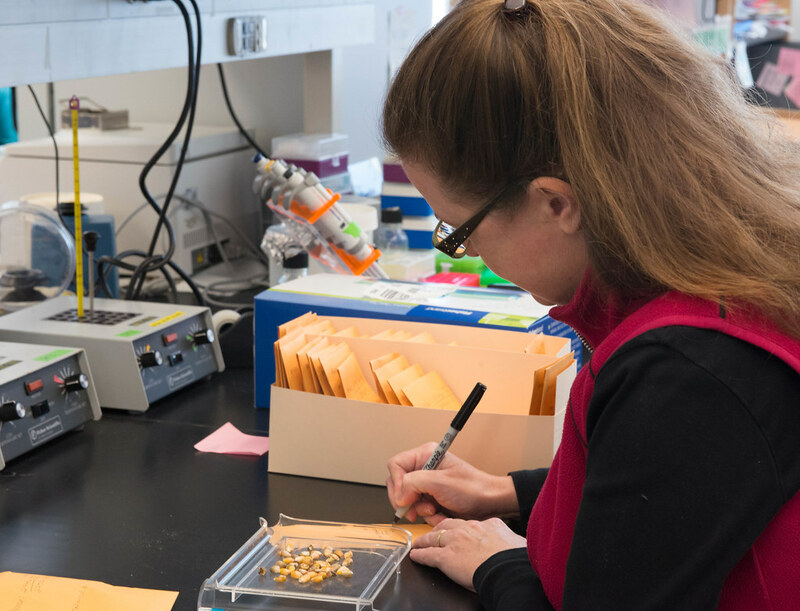 She thinks it as she counts kernels from corn crosses that will be sent to Hawaii, a hotspot for corn geneticists looking to add a second harvest to their research year. And she sees it in the students she mentors as a professor of biological sciences at MU and a researcher at the Bond Life Sciences Center. McSteen entered the field of corn genetics 21 years ago, as a post-doctoral fellow in Berkeley. “What’s really amazing is that when you plant a field of corn, the field is just bare,” McSteen says. The feeling hasn’t gone away. McSteen, who is Irish, grew up far removed from the sunny cornfields she works in. As a child in Dublin, she wasn’t particular outdoorsy. When her family went camping by the sea over the summer holidays, McSteen spent most of her time reading books. Her favorite subject in school was science. By the time she sat for her high school leaving exam, her classes were mainly in geography, science or math. She applied and was accepted to her top choice university, Trinity College Dublin, where she studied genetics. She went on to pursue a PhD in Norwich, England studying how snapdragons make flowers. 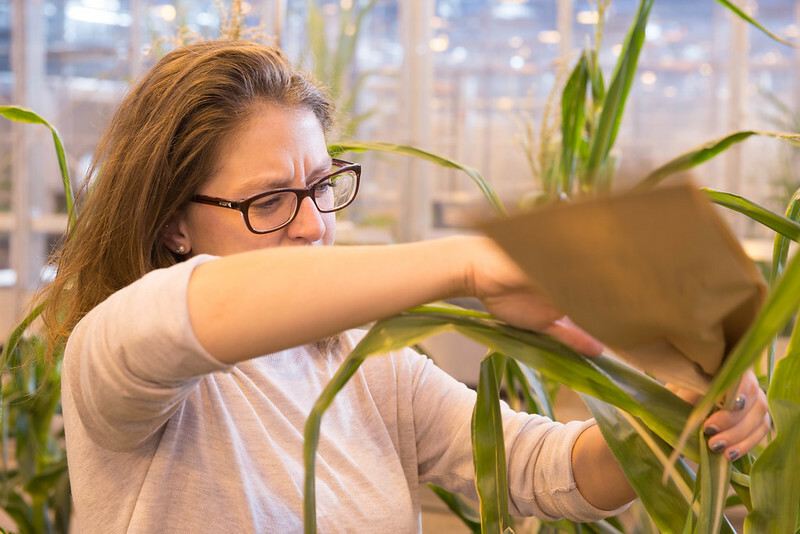 When it came time for her to do her post-doc, she had the choice to work on Arabidopsis, a popular plant model, or maize, a crop with many opportunities for research funding. She chose the latter. The decision changed the course of her career, from her research focus to her country of residence. Corn brought her to California, Pennsylvania and then the University of Missouri, which has a long history of corn genetics. McSteen studies a part of corn plants called the meristem, which is filled with stem cells that become the reproductive organs of the plant: the tassel and the ears. The tassel, where pollen is produced, is found at the top of the cornstalk, while the ears, which are the female reproductive organs, jut out from the sides. When and how they form depend on a growth hormone called auxin. To understand auxin regulation, McSteen begins every summer with a field full of mutants. Each kernel contains a mutation, but it’s impossible to tell at first what is causing the mutation. McSteen is interested in mutations that affect the tassels or ears. These plants produce ears with fewer kernels or tassels with fewer branches. Or they fail to make ears or tassels altogether. The defects are outward signs of problems in meristem development, and hint at disruptions to genes that are involved in how auxin is made, transported or perceived by the plant. Once a mutant is identified, McSteen works backwards to find out which gene is causing the mutation, and where it is located on the chromosome. To date, her group has identified multiple genes related to auxin-mediated development, as well as two genes that affect the uptake or synthesis of essential nutrients. A third project revolves around a strain of corn that produces half as many kernels as regular corn, causing it to look like grains such as rice or wheat. McSteen thinks that if they can understand what’s causing the shortfall in kernel development, it may be possible to engineer grains like rice and wheat to “double kernel” the way that corn does. Ultimately, studying these genes help corn researchers to better understand plant development and improve yield. To keep all their experiments going, the McSteen lab plants three acres of corn every summer. Each acre contains 750 rows; each row holds 30 plants. With the aid of a hand held planter, they drop 67,500 kernels into the soil. Then they do what McSteen calls a lopsided “planter’s shuffle” to stamp the soil down so that it covers every kernel. During Missouri summers, temperatures can reach over 100 degrees Fahrenheit. It feels even hotter when it rains. The ground is either hard as a rock before it rains or so muddy after it rains that researchers have to take care not to wrench their ankles in the thick muck. McSteen has worked on corn for so long that she’s developed severe allergies to corn pollen. 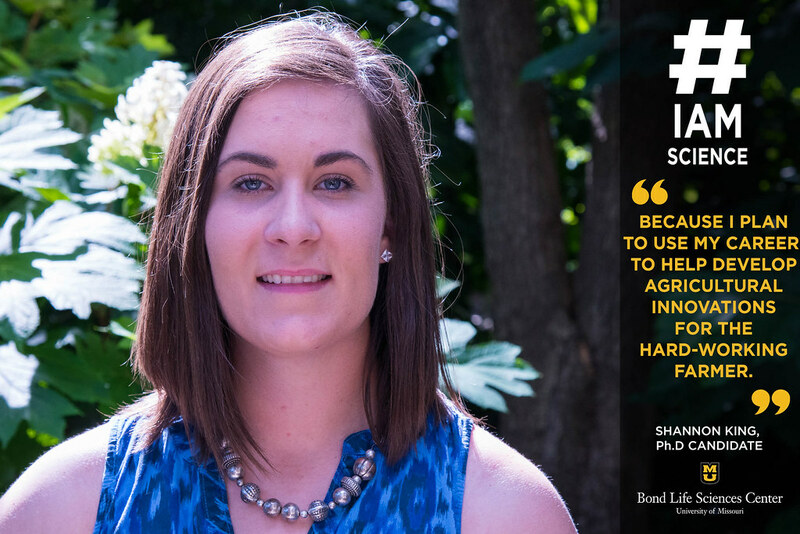 It’s not uncommon among corn researchers, but her allergies prevent her from taking part in the pollination step that takes place at the height of summer. 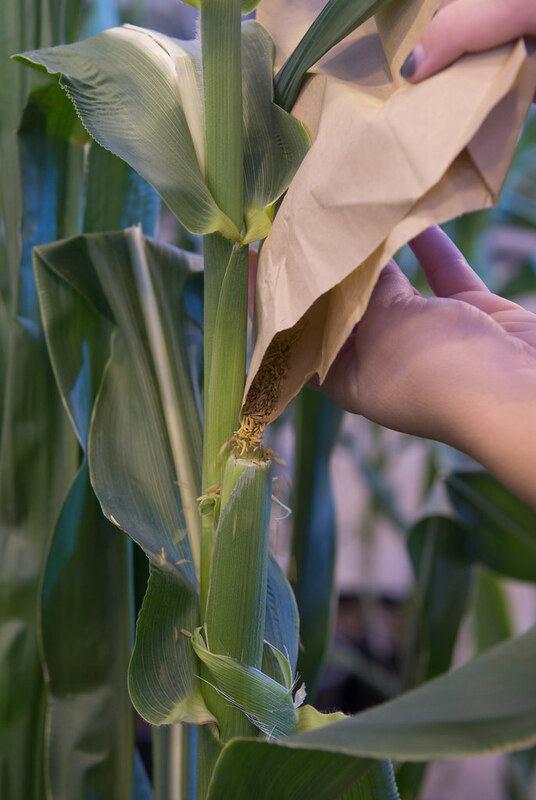 To pollinate the corn, they slip paper bags over the ears and tassel of their plants. Covering the ears prevents accidental fertilization of the ears from stray pollen blown about by the wind. The bag over the tassel allows researchers to collect the yellow powder that will be used for controlled pollination. “The next day, you bang the tassel and the pollen falls out into the bag,” McSteen says. “Then you gather it all up and you pour it on the ear.” It’s possible to pollinate about 100 plants in an hour, but you have to start early and work quickly, McSteen says. Otherwise, all the pollen is dead by noon. McSteen’s allergies prevent her from shelling corn as well, but she’s on deck for planting and harvest time and all the other stages in between. “To be a corn geneticist, you have to be very organized and plan ahead,” McSteen says. Because it takes a long time to grow several generations of corn, she’s only beginning to see the results of experiments she started years ago. As a way to increase productivity, corn researchers send their seeds to warm places such as Mexico, Chile or Hawaii that can accommodate a winter harvest. 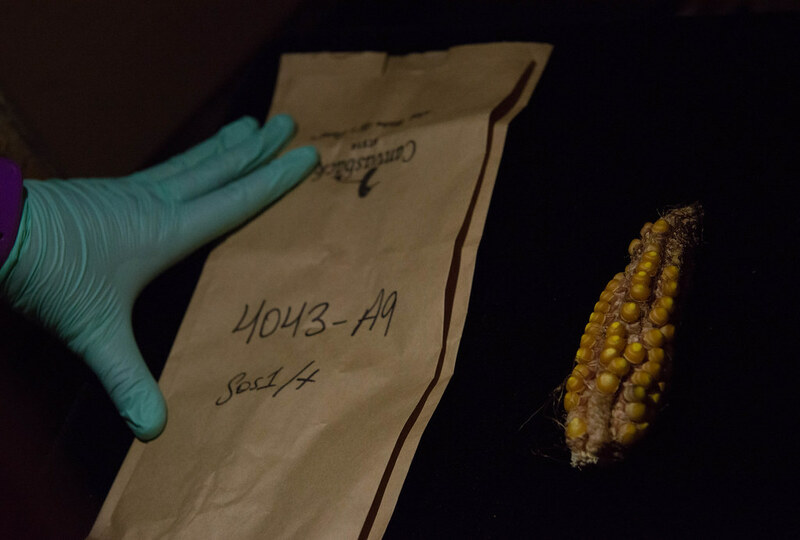 In the lab, McSteen chooses kernels from carefully selected mutants to ship to an island in Hawaii. There, a company will plant and harvest the corn for her, but she usually sends two of her researchers down to take care of the pollinations themselves. McSteen counts out thirteen yellow kernels that are shiny and mold-free. “Potential,” she says, as she slips the seeds in an envelope with the cross information labeled on the front. In her experience, the corn community tends to be collaborative rather than competitive. She suspects it’s because everyone recognizes that corn takes a long time to grow. McSteen is as serious about mentorship as she is about corn. “It’s part of the job of being a professor”. According to Katy Guthrie, a second year graduate student in the lab, McSteen takes a Goldilocks approach to managing her students. A post-doc wanted to do go into teaching, so McSteen invited her to co-teach her class. Her post-doc went on to become a teaching professor at Mizzou. Another student turned her research experience in mapping mutants in corn into a successful career at a corn company. As the new building manager for the Bond Life Sciences Center, Dean Bergstrom makes it possible for everyone else to focus on his or her research. He’s worked in Bond LSC for nine and a half years as a research technician, and in Tucker Hall eleven years before that. His unique science background and hands on knowledge of this building means that he knows exactly what scientists need to complete their projects. A facility with such diverse research interests as Bond LSC might seem overwhelming to manage, but Dean is eager to tackle the challenge. “My background as a technician means I’m the perfect person to step into this role,” he said.